Jim Dolan reports from the East Village. 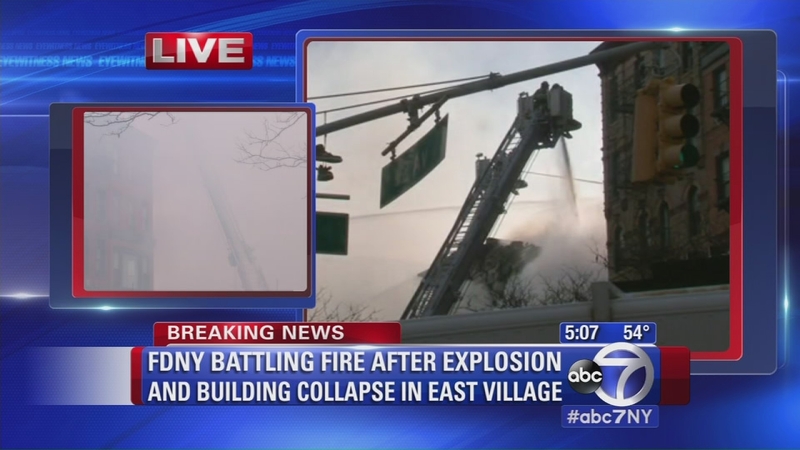 EAST VILLAGE (WABC) -- Crews have now reached the basement level of the collapsed building in last week's Manhattan East Village explosion -- where the initial blast occurred. Investigators will now be able to examine the building's gas line to see if it was tapped into illegally. Workers will continue to remove debris as the investigation continues. Earlier this week, officials positively identified the second fatal victim. The city's Medical Examiner on Wednesday confirmed the victim as 26-year-old restaurant worker Moises Ismael Locon Yac using DNA analysis. He and another man were killed and 22 other people were injured when the apartment building exploded last Thursday afternoon. Officials are investigating whether someone had illegally tapped into a natural gas line. The restaurant employee had been working six days a week. His family said that during his rare free time he enjoyed taking his nephew to a park in Queens. The other victim, 23-year-old Nicholas Figueroa, was on a date at the restaurant when the explosion occurred. The woman with him was injured but survived the blast. 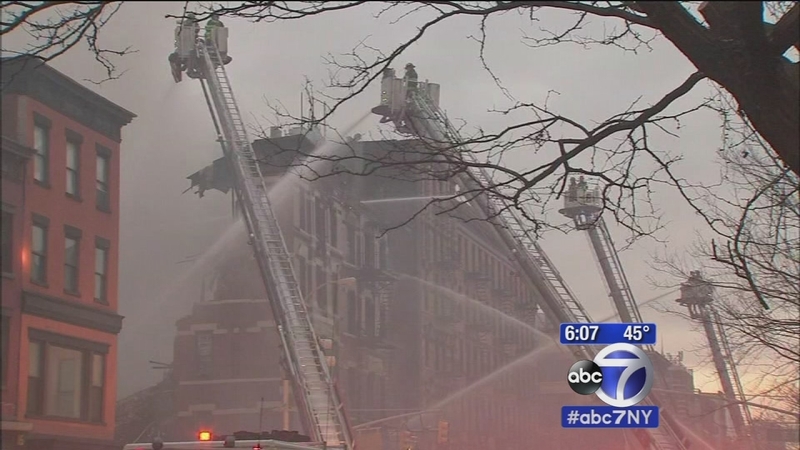 According to the New York City Fire Department reported that it was continuing to check debris. About 30 firefighters remain on site. Nearly two dozen people were injured, four critically, in the blast. New York City's mayor says three of the four people critically injured have been released from the hospital. New York Mayor Bill de Blasio said at a news conference Monday that the remaining patient was in Bellevue Hospital and "doing well." He said fire marshals, the NYPD and the district attorney's office were investigating the cause of Thursday's apparent gas explosion. It killed two people and leveled three buildings. De Blasio said he hasn't ruled out policy changes, or tougher penalties for those caught tampering with gas, but the investigation must conclude that first. Two were killed in the blast and their bodies were pulled from the rubble Sunday. In a press conference Sunday evening, FDNY Commissioner Daniel Nigro said that the two were found within 20 feet of each other in the rubble. He said that no conclusions were reached, but that it does not mean that there are no lessons learned from the flames and the explosion. "If you're smelling gas, you call 911," OEM Commissioner Joseph Esposito said. "That's what they didn't do here." Meanwhile, city officials say criminal charges could be filed as a result of the explosion. Sources say investigators with the Manhattan District Attorney's office are now fully engaged. Jim Hoffer has the latest on the investigation, including the possibility that a gas line may have been inappropriately accessed. Many gathered and cried in the East Village Monday night at a vigil. The devastated family and friends of Figueroa, 23, came together on a bitter, cold night. "He was beautiful. I can't wait until I can see my son again, hug him, kiss him, and tell him I love him," said Nixon Figueroa, the victim's father. The family came to the East Village, in the shadow of the rubble where Nicholas' body was found Sunday. They lit candles and prayed and his father held up his son's picture. Figueroa had just graduated from college and had so many dreams, his family said. "He wanted to be a firefighter, a police officer, that's why he went into criminal justice, he was just getting ready to register for classes to become an EMT, he wanted to be involved, he wanted to be part of something, and that's who he was," said Ann Figueroa, the victim's mother. Teresa Galarce, still limping and with two black eyes, was injured in the blast. She had just had lunch with Figueroa that day. She did not speak Tuesday night. Diane McLean was not home when the explosion destroyed the building she's lived in for 35 years. She has raised her three young children there and they are now homeless. Like several others in the building, her apartment was rent stabilized, and the explosion now sets the owner up to make more money. "She can rebuild a new building and charge whatever she wishes, she can rebuild apartments as she can get zoning for, and that is completely unfair," McLean said. The mayor says most residents in the surrounding area who were evacuated immediately after the blast have returned to their homes. De Blasio made a special visit to Engine 33 Saturday to personally thank some of the first responders who showed amazing bravery under pressure, including Mike Shepherd, who climbed up a fire escape looking through the apartments. "This is truly heroic, you have a dad who is a real hero," de Blasio told Shepherd's 10-year-old son, Michael Patrick. Standing at a police barricade, Micha Gerland surveyed the remains of his apartment. "I still don't believe it," said Gerland, 37, a restaurant manager who escaped with nothing but his wallet, his phone, his keys and the clothes he was wearing. "Who thinks that something like that happens?" The FDNY arrived on the scene around 3:15 p.m. Thursday and found the first and second levels of 121 2nd Ave. blown out and smoke pluming throughout the five-story building. It is believed the explosion happened inside a restaurant on the first floor, called Sushi Park, and de Blasio said the preliminary investigation points to gas and plumbing work inside. About 10 minutes after the initial blast, flames began shooting through the roof and quickly spread to the neighboring building, 123 2nd Avenue, which houses the Pommes Frites. Both collapsed, and a third building, which houses East Noodle ramen shop at 119 2nd Ave., collapsed overnight Thursday. Con Ed was at the building earlier in the afternoon, around 2 p.m. But there were no gas leaks detected at that time. In a statement, Con Ed confirmed it had been at the scene to evaluate work at 121 2nd Ave.
"Our records show the work of the building's plumber failed two inspections, including the inspection our personnel conducted yesterday afternoon," the statement said. "At no time was use of the new service line authorized by Con Edison. That service was locked to ensure that it would not be used. The ground-floor restaurant was being served by its current, smaller gas service line." 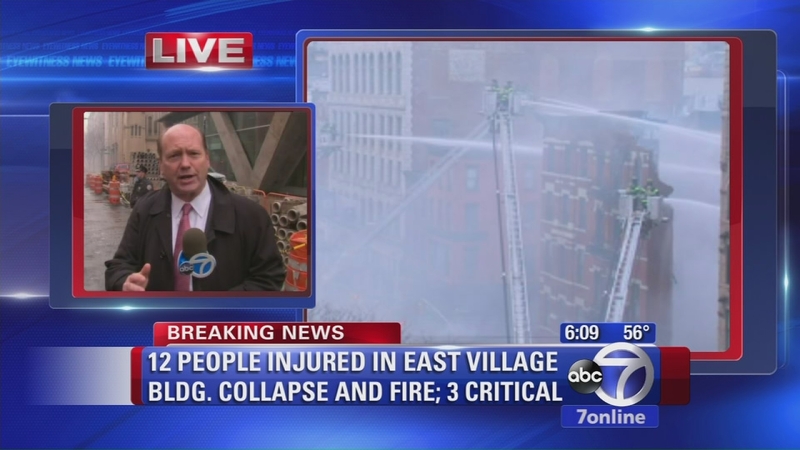 Josh Einiger has the latest from the scene of the collapse at 2nd Avenue and East 7th Street. Nigro said that for the first 15 minutes before the building started to collapse, firefighters made extremely dangerous searches of the buildings to locate any victims before eventually pulling out. Reoccupancy is expected Tuesday for businesses on Second Avenue between Seventh and St. Marks. A bus lane is now open on the east side of Second Avenue. There is no southbound traffic between Fifth Street and 14th Street on Second. There is no crosstown traffic from Sixth Street to St. Marks Place. Eyewitnesses described the scene after an explosion and collapse at an apartment building in Manhattan Thursday. "Some glass had blown all the way across the street, people injured," said a visibly shaken James Cole, who lives a few buildings down and fled in just a pair of shorts, sneakers and a sport coat after returning from the gym just prior to the explosion. "There were some Good Samaritans who were helping them, and there was a woman trapped on her fire escape, so they helped her get down. One guy, after helping her, ran back up, and it was already starting to smoke, and he was checking each apartment." "I just heard a boom, and I came out and saw the fire escape had come off the building and the whole bottom of the building came out onto the sidewalk," a witness said. "Everyone was taking off, and it just, boom, and it was smoke, and then it was on fire, instantly on fire...People were panicking, like no one knew what was going on, and it was very shocking. You could feel the ground move." The explosion was so forceful it blew the door off a cafe across the street and left piles of rubble on the sidewalk. The Department of Environmental Protection says 126 air samples have been taken in the blast area, and all are negative for asbestos. As a reminder, people are urged to avoid the area around the explosion.